The Ten Commandments began with the words, “You shall have no other gods before Me. You shall not make for yourself an idol, or any likeness of what is in heaven above or on the earth beneath or in the water under the earth” (Ex. 20:3-4). This prohibition of idolatry, perhaps more than any other single thing, set apart the people of God from other nations. 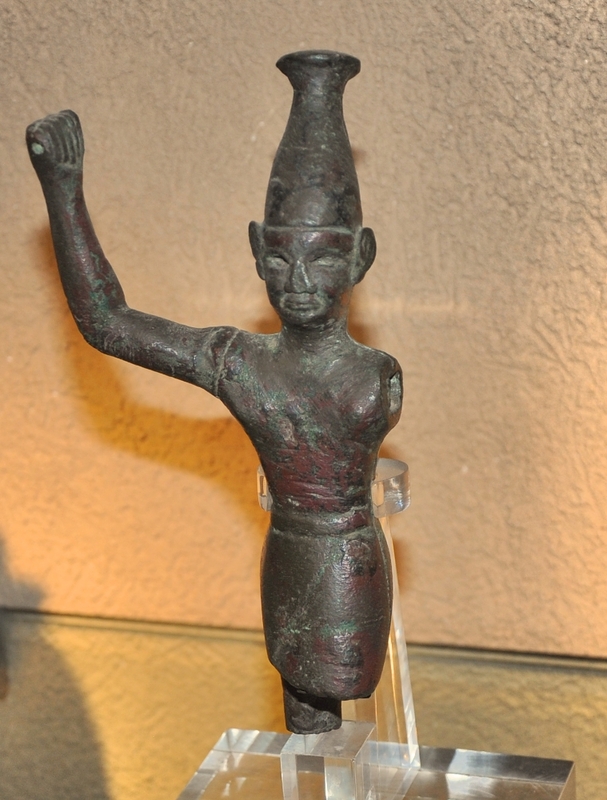 Baal, displayed at Hecht Museum at Haifa University, Israel. Photo by Leon Mauldin. The pagan peoples who inhabited the land of Canaan before the Israelites arrived also worshiped many gods and goddesses. The Canaanite literature discovered at RAS SHAMRA (on the site of the ancient city of Ugarit) on the Syrian coast provides abundant information about several gods mentioned in the Bible. The Canaanite god most often referred to is Baal, which means “lord” or “master.” The word could be used as a title for any person who owned something, or any god considered to be a lord or master. But the word Baal soon became identified with various regional gods that were thought to provide fertility for crops and livestock. As a god who symbolized the productive forces of nature, Baal was worshiped with much sensuality (Num. 22:41; Judg. 2:13; 1 Kin. 16:31–32). Baal appeared in many forms and under many different names. The Bible often makes reference to the Baalim (the plural of Baal, KJV) or to the Baals (NKJV; Judg. 2:11; 1 Kin. 18:18; Jer. 2:23). (Youngblood, Bruce, & Harrison. Nelson’s New Illustrated Bible Dictionary). We have previously posted on Baal worship here. This entry was posted on Tuesday, April 26th, 2016 at 5:20 PM and is filed under Bible History and Geography, Bible Study, Israel, Old Testament, photography, Travel. You can follow any responses to this entry through the RSS 2.0 feed. You can leave a response, or trackback from your own site.